What’this? Production gear reviews on a post-production blog? Yup, that’s right. We’re not all just codecs and compression here at SuiteTake; we do actually put on our shoes and socks and get to shoot too. In fact, there’s nothing better to appreciate parking your rear in a comfy edit chair all day long that luggin’ production gear around on an old fashioned shoot now and then. So yes, we do shoot here too and have come across a few nifty little production gadgets that have proved very helpful in the field: The Lite Panels Micro Pro and Chimera’s Color Correction Screens for their softboxes. What’s this? Production gear reviews on a post-production blog? Yup, that’s right. We’re not all just codecs and compression here at SuiteTake; we do actually put on our shoes and socks and get to shoot too. In fact, there’s nothing better to appreciate parking your rear in a comfy edit chair all day long then luggin’ production gear around on an old fashioned shoot now and then. First the Lite Panel Micro Pro. We had a shoot come up where we were going to need to shoot close ups of a persons foot walking across a floor in a day-for-night situation. Looking at our standard Arri lighting kit there was nothing in there that would really do the trick for casting the small pool of light we would need to illuminate the foot as it walked across the floor. All of our instruments were just too big for the task, the smallest of our lights being a 300. We looked and found the Lite Panels Micro Pro and thought it would be the perfect fit. First, the construction. The Lite Panel Micro Pro right out of the box feels cheep, and at around $450 from B&H, it isn’t exactly cheep. The body is all plastic, but the not the good solid and refined plastic that you’d find in a Toyota or on an iPod, the cheep brittle plastic more akin to a carnival toy. 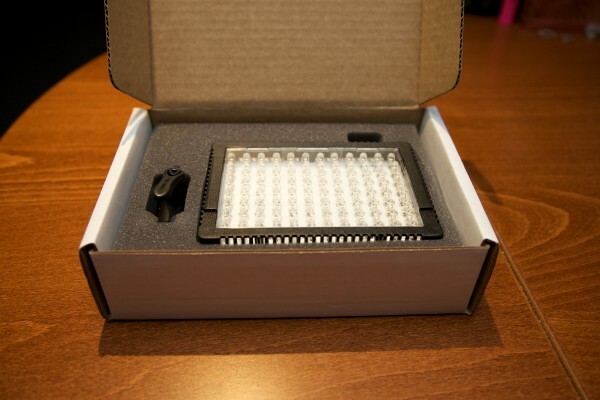 It has 96 LEDs in a grid, is powered by 6 AAs or DC in (power source sold separately, but certainly something you could get at Radio Shack), has a power control dimming knob on top and standard screw-in shoe mount on the bottom. In the box is the Micro Pro, a flimsy shoe mount with ball head a CTO filter, warming filter, and diffusion filter. While the Lite Panel Micro Pro feels and looks cheep in performance it is not, it has held up well to our production demands so far (which are rather light by comparison to more rigorous demands). I suspect that a drop or good whack to a c-stand could crack the casing, however, it should be noted that an LED won’t be damaged by an impact in the same way a tungsten bulb would. The shoe mount is the real weak link in the kit. It is flimsy and poorly made. When you tighten down the stop on the ball head it causes the positioning of the panel to change significantly due to the pressure applied to the ball and socket making it futile to position the panel and then lock it down. What I have ended up doing is to tighten down the ball head to a mid-range of tightness and then just force adjust the panel to where I want it. The Lite Panel Micro Pro is balanced for daylight out of the box and the filters it comes with do a fine job of correcting to incandescent. 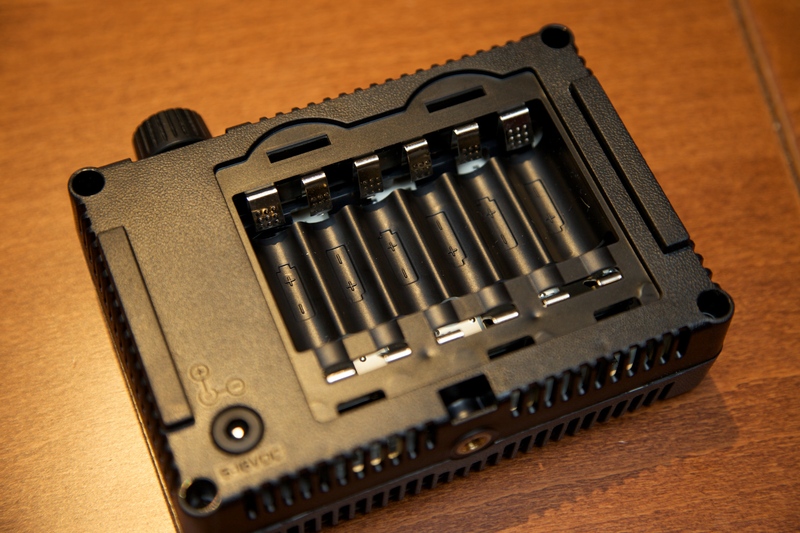 They fit onto the front of the panel via slots on either side of the casing and hold in place well. There are also slots on the back of the panel to hold the filters when not in use, although our particular unit’s rear slots are too narrowly spaced to accommodate the filters so they are bowed when placed there. Not a big deal because they do stay put but it is annoying enough to me that I usually don’t keep them there. 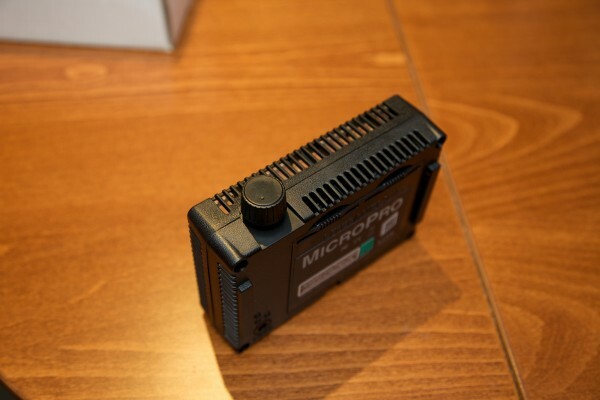 Battery life is excellent and the Lite Panel Micro Pro simply does not heat up one bit. We were attracted to the Lite Panel because we thought it would be able to cast an even pool of light without the usual hot spots associated with traditional on-camera lights. In performance the Lite Panel Micro Pro was capable of both. 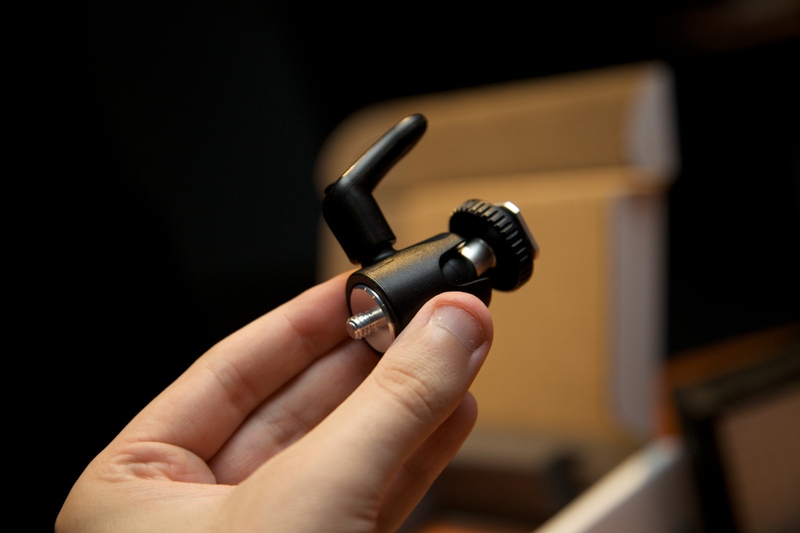 The best thing about it is the adjustable power knob on the top of the unit. There are no stops, marks, or clicks in the knob, it’s just a smooth pot all around with a solid click to turn completely off. I like this because you can dial the intensity of the light to a virtually unlimited range. And that is really how this light needs to be used. 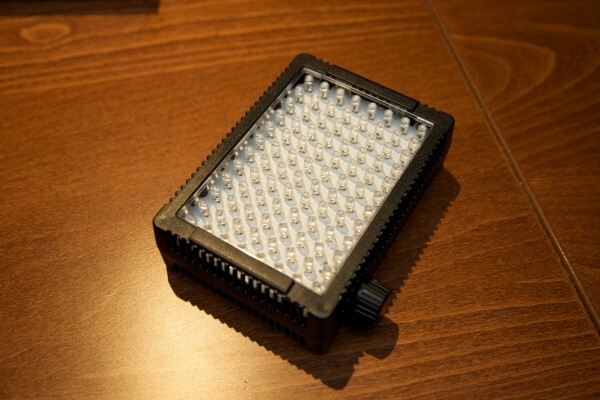 The Lite Panel Micro Pro is not a key light. It should not be used as a main source of light in just about any situation. If you buy this light to act as a main source of light for quick head shots or interviews you’ll likely be disappointed. Rather it excels at being that little extra, that little kicker you need to add a little splash to the details of your scene. In our case we need a little punch down on the floor and it did an excellent job at that. I’ve found that I always use the panel at about 50-65% of its max power and have never used it at full power. When potted up to full power it just becomes a big raunchy hot spot like any other on-camera light. The key to using the Lite Panel Micro Pro is to pot it to 50-65% just to add a little bit of punch or kick to your scene, and we love it for that. We have found a use for it in just about every setup we’ve done. 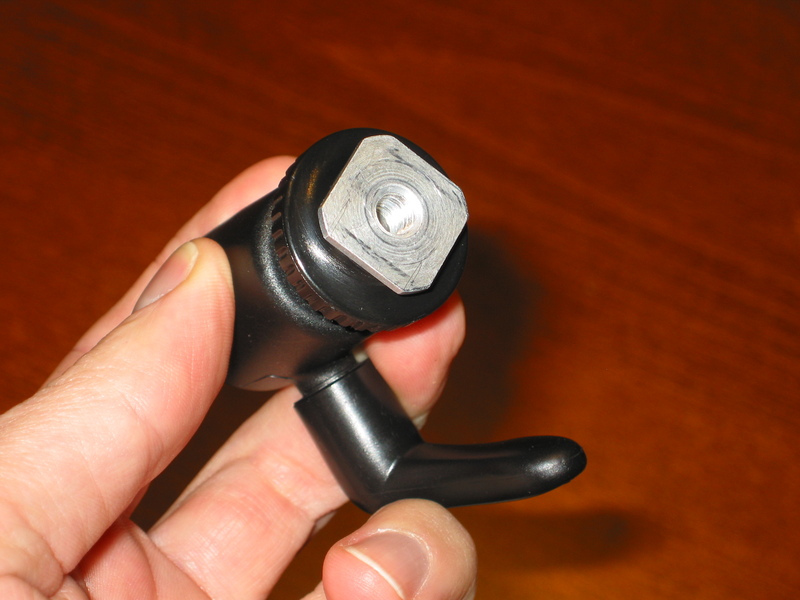 It should be noted that while the shoe mount adapter is a piece of garbage it does have a standard tripod screw threading on the bottom of it so it can be directly attached to a photo ball head tripod or other light stand with a screw mount and used as an off-camera light. We do this all the time. Like I’ve said, the Lite Panel Micro Pro is a great little kicker, it’s NOT a key light. It’s small size allow it to be placed in tight spots where traditional fresnels won’t fit, and lack of heat make it safe in those small spaces as well. 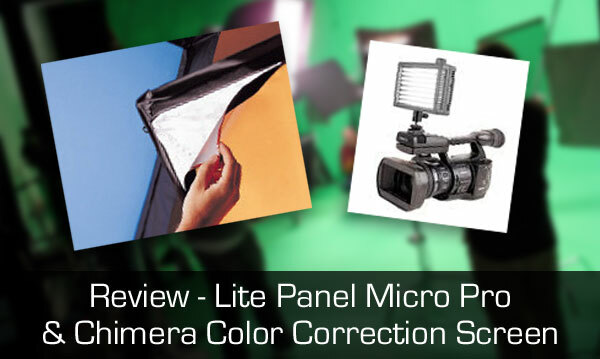 Yes, we are disappointed in the chincy construction but we absolutely love our Lite Panel Micro Pro. Another cool little toy we have in our kit is a color correction screen for our Chimera soft box. 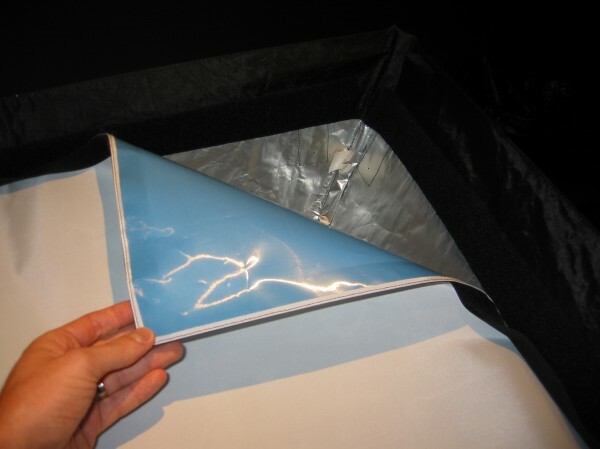 Chimera makes several different flavors of color correction screens for their popular softboxes. They make 1/8, 1/4. 1/2, 3/4, and full versions of CTB and CTO for all sizes of their softboxes. We had a shoot where we were going to need to shoot indoors with significant amounts of daylight coming through windows. Geling the windows with CTO wasn’t an option with the time and budget we had, neither was renting an HMI kit. I got to thinking that there had to be something out there to color correct Chimeras. In the past we had C-47’d CTB to the inside of our Chimera in a pinch and ended up getting marginal results and melted gels. I went looking and quickly found Chimera’s offerings. We got a 1/2 blue CTB color correction screen for our softbox. The construction is excellent Chimera quality. To my surprise though, the screen is little more than a regular white front Chimera diffuser cloth with a regular CTB gel sewn to the back with velcro all around to attach it. The CTB is an actual gel! Because of this I do take a little extra care of it not to crinkle it too much and remove it when packing it away for the day. I roll it up and keep it in it’s original product box. The light quality from it is great. It’s exactly what you’d expect from precisely positioning a CTB gel at the front of your softbox. Also as expected it does cut down the amount of light output according to the thickness of gel you are using. To compensate we sometimes remove the inner baffle from the softbox. We always remove the standard white diffuser from the front of our Chimera before attaching the color correction screen but I suppose if you wanted that extra diffusion and didn’t need the extra light output you could leave it on, there is room on the softbox’s velcro strip to accommodate both. We’ve used our screen in many mixed light situations (that’s primarily why we went with a 1/2 blue instead of a full blue) and it makes for a healthy white balance. It has proven to be indispensable when shooting in rooms with lots of windows. 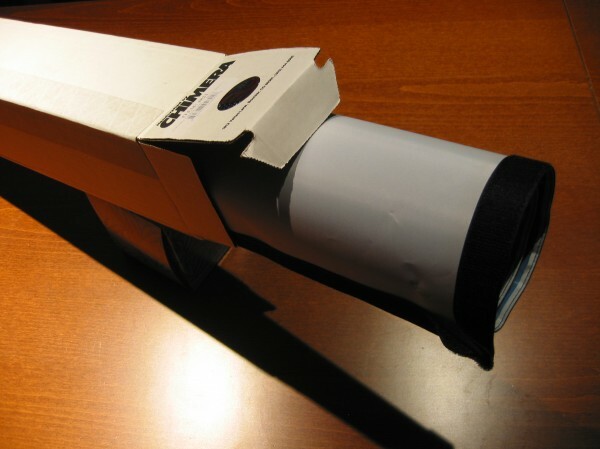 With a tool like this you can actually leave the blinds open and use that available light for a change! The Lite Panel Micro Pro is an awesome little kicker light that has proved it worth many times over in a wide variety of shooting situations. It’s construction is sub-par and shoe mount is utter garbage but gives a great even splash of light quickly and easily right where you need it. The Lite Panel Micro Pro is very useful both on a off the camera. At almost $450 it’s priced a little on the high side, but you’ll be amazed at how often you’re able to use it in the field or the studio. Chimera Color Correction Screens are great “poor-man’s” HMIs. At about $40 bucks a pop for the mid range sizes they are within just about anyone’s budget. With one of these slick screens say goodbye to the days of pulling all the shades and hello to using available light indoors again. And yes, we do get off our butts now and then and do a little shooting here at SutieTake!